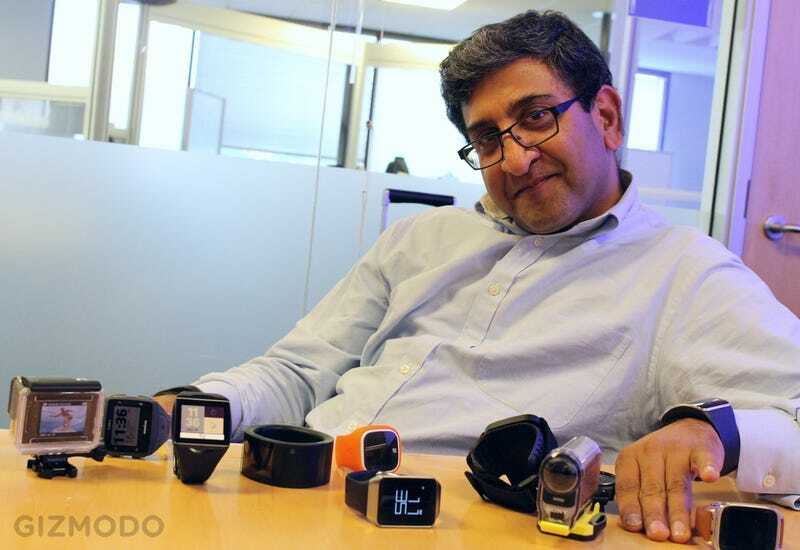 "This trend is not going away," says Pankaj Kedia, the head of Qualcomm's new wearables business unit. "This is not a fad." Of course he'd say that—his job depends on it. But who other than Qualcomm—the company which dominates the mobile industry—would know for sure? So I grilled Qualcomm's wearables boss about our sensor-equipped future. Why aren't wearables a fad? I tell Kedia I'm not convinced by smartwatches, that I've yet to see a smartwatch do anything more conveniently that I can do by just pulling out my phone—that the mere ability to not have to pull out my phone isn't worth charging a second device every evening. But for the right use cases, argues Kedia, wearables can make sense. "We don't ask do you need a bike, if you have a car. It's the right device for the right scenario." For instance, wearables aren't just wristbands and fancy augmented reality glasses. What about wearable cameras? "We were talking to GoPro when people didn't know how to spell GoPro," says Kedia. "When I go bungie jumping, I wear it. How many things do you want to have on you when you go bungie jumping?" What about devices for kids? Kedia shows me the Infomark Joon, a super simple wristphone designed for Korean children ages 3 to 7. It's got a built-in GPS so you can keep an eye on their location, and it lets them call home or call for help with a single button press. "You're not going to give your three-year-old a phone, but you want to know where she is," points out the Qualcomm exec. And though he won't talk about the dollar signs, Kedia says the first crop of smartwatches are doing "quite well" too. "We're in the first inning of an [nine]-inning game... think about the first smartphones, the first tablets... we are in that stage." It also speaks volumes, he points out, that these wearables are already on sale in 30+ countries. "There is technology coming where you can sense your individuality," says Kedia, suggesting that wearables could be excellent personal identification devices. Who hasn't heard of the idea of replacing your passwords with a ring you wear on your finger? Kedia sees battery life improving steadily, even for the more powerful wristables: "Today, you're seeing two-day kind of battery life, a week of battery in clock or standby mode. You'll see two days going to three days and four days over the next couple of years." Quick charging, as seen in the recent crop of smartphones, is also coming to wearable devices. What's the point of having a smartwatch that can track my sleep if it needs to be on the charger every evening? "Most days I take a shower," replies Kedia, implying that we might be able to juice up the tiny batteries in these devices really, really fast. More and more sophisticated sensors are on the way. "Today you don't have GPS in every watch. Why don't you have GPS in every watch?" Plus environmental sensors, like ones that can measure air quality. And, despite our not-so-favorable impressions of the Samsung Gear S wristphone, Qualcomm believes that more and more wearables will have cellular connectivity. But they won't necessarily need to use their own cellular radio all the time—they'll smartly transition between using your Bluetooth-connected phone, Wi-Fi, and cellular, something Kedia calls "always-connected" for short. "This is gravity. A phone without service is useless. Three years from now, a wristwatch without always-connected will be an anomaly," Kedia predicts. Three to five years out, he says, we might even have ingestibles that that can warn doctors about impending heart attacks. "In our labs we're working on stuff like that." You might joke about eating batteries, but it's a serious idea. Again, of course Qualcomm would say that wearables are a great business opportunity now that they've decided a business opportunity exists. They're duty-bound to help create a market for the technology now. But the fact that Qualcomm has decided to do just that is a pretty good sign for the future of wearables. Instead of using (comparatively) power-hungry processors with extraneous features like quad cores and powerful 3D graphics, Qualcomm could make purpose-built chipsets for the wearable space that better match those needs. Kedia hints as much during our conversation. And Qualcomm has invested in low-power Mirasol screens, wireless charging specifications, and all sorts of sensor technologies that could help too. Qualcomm's now a company with a lot of clout, and a company that has a lot of incentive to make it happen. Because when Qualcomm bet big on smartphones back in the '90s, they set themselves up to become the next Intel—the company inside devices changing the world.